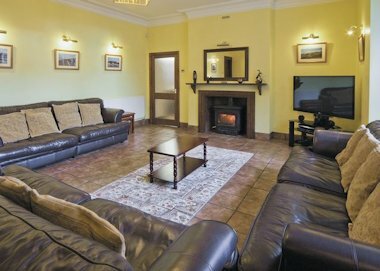 A large, well appointed Barmouth self catering holiday cottage. Recently renovated with modern facilities, period furniture and attractive original features. Six double bedrooms and four bathrooms. Penbryn Mynach comprises a very spacious sitting room, separate dining room for 12, well equipped kitchen, conservatory, cloakroom/WC. Three double bedrooms, two with en-suites, three twin bedrooms, one with en-suite and one bathroom/WC. Plus cot. Penbryn Mynach is in the town of Barmouth in the county of Gwynedd in Wales. It is peacefully situated within a short walk of Barmouth town’s bustling shops, restaurants, pubs, old harbour and seaside attractions, including a glorious sweep of golden sandy beach. Easy access to local hill walks. Penbryn Mynach is available throughout the year for Barmouth self catering holidays, including Christmas and New Year.